So, Friday night saw the Private View of the Opening exhibition at the Sentinel Gallery in Wivenhoe. It was SO CROWDED that when I arrived there were people waiting outside to get in, and once I did get in moving was very difficult! I know quite a number of the artists who are showing, but the only one I saw was Elizabeth Morris, who is showing 5 or 6 of her beautiful etchings. I was delighted when Julia, one of my former colleagues from the school where I used to teach, bought Liz’s ‘Evening Moorings’. A bit later I bumped into Chas Crocker from Woodprojects in the throng – Chas showed with us at the Lexden Arts Festival last year. If anyone else was there whom I knew, I couldn’t see them in the crowds, and I soon decided that it was much better to come back and look at the work on another – quieter! – day. So on Saturday afternoon I went back for another viewing, taking Graham with me this time. It was still busy, but we were able to see everything, and really enjoyed looking at the work. I loved the long narrow textile pieces by Annie Bielecka – I’m so glad that she is showing with the Lexden Arts Festival this year! We were also very taken with the photographs of David Morris and Wendy Thomas, and with Tracey Saunders’ watercolours. 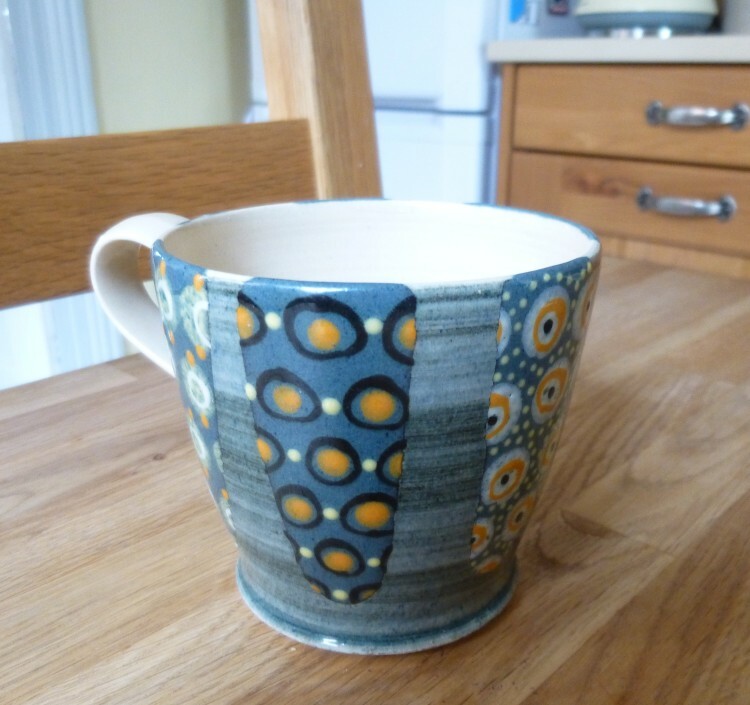 There were some beautiful painted wildfowl, fish and hares on driftwood which I think were by Meriel Ensom, and I loved the ceramics of Sara Paynter – in fact I bought myself one of her intricately decorated mugs, which has instantly become my favourite coffee mug! If you live in the Colchester area do make the time to go down to Wivenhoe and have a look – the gallery is open Wednesday – Sunday, 10.00am-5.00pm until 18th April.